Q: Dear Superfoodly, I’m making Chex Mix. Is there a substitute for Worcestershire sauce which is both vegan and gluten free? Because one of the people eating is celiac and the other is a strict vegan. A: The good news is you’re asking the right people! 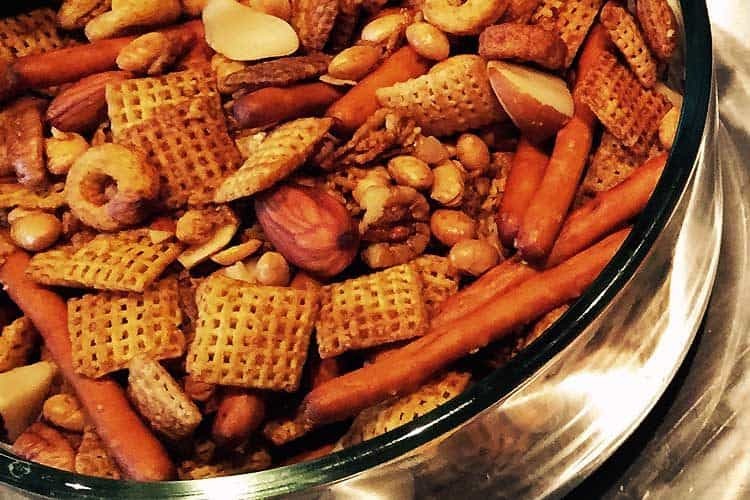 From Thanksgiving through Christmas for the past five years, you will find us slaving away in the kitchen making a Chex Mix recipe which fulfills those exact characteristics (pictured above). You don’t need a substitute recipe. There are plenty of options on the market. 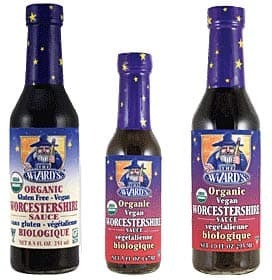 The bad news is that you will almost certainly need to buy the vegan Worcestershire sauce online. Lea & Perrins isn’t going to cut it. 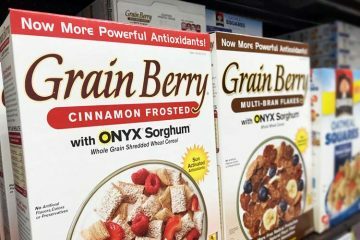 There are only two brands on the market which are labeled as being both vegan and GF. Even here in LA where Superfoodly is located, none of the Whole Foods we shop at carry them and the independent health food stores stopped carrying them due to lack of demand (we asked why last year when it was no longer on the shelf). If it’s just gluten free Worcestershire that you need and don’t care about it being organic, then you can pick some up at almost any regular grocery store, Walmart, Target, Costco, Meijer’s, etc. Surprisingly Whole Foods might not have a GF version for sale. They recently reformulated their ingredients and took out the obvious gluten sources (wheat) but their marketing for it does not label it as gluten free and/or vegan. As of the time of this review, the icons for vegetarian, paleo, and organic are on the website’s product page and that’s it. The other brand they carry in store, Annie’s Naturals, definitely has gluten. 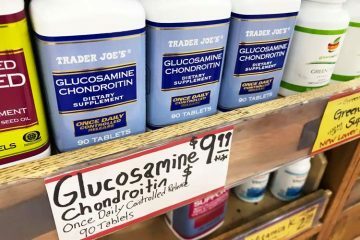 Does Trader Joe’s sell Worcestershire sauce? Nope. Heinz X Distilled White Vinegar, Water, Molasses, High Fructose Corn Syrup,,Salt, Soy Sauce (Water, Salt, Hydrolyzed Soy Protein, Corn Syrup,Caramel Coloring), Natural Flavorings, Caramel Coloring, Anchovies, Polysorbate 80, Soy Flour, Garlic Extract. French’s X Distilled Vinegar, Water, Molasses, Corn Syrup, Salt, Sugar, Spices, Caramel Color, Anchovies, Natural Flavors (Soy), Xanthan Gum, Dehydrated Garlic Powder and Tamarind Extract. 365 Everyday Value Organic (Whole Foods brand) ? ? 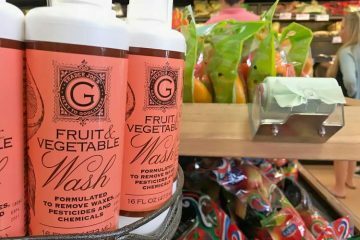 X Organic white vinegar, Organic molasses, Filtered water, Organic cane sugar, Salt, Organic caramel color, Organic garlic powder, Organic black pepper, Organic allspice, Organic nutmeg, Organic cloves, Organic ginger, Organic cayenne peppers, Xanthan gum. Robbies X X Water, Apple Cider Vinegar, Blackstrap Molasses, White Grape Concentrate, Tapioca Starch, Hydrolyzed Soy Protein, Organic Caramel Color, Garlic Powder, Salt, Onion Powder, Spices, Sugar, Yeast Extract, Natural Flavors. Ingredients are sometimes different in other countries. For example Kraft Heinz says it’s only gluten free for U.S. and Canada. For Lea and Perrins (another brand they own) they say only the U.S. version is gluten free but it has anchovy, so not vegan. (1). Speaking of changes, many online pictures – including those on Amazon and Walmart product pages today when we checked – were showing French’s, Heinz, and Lea & Perrins as containing wheat in their ingredients list. 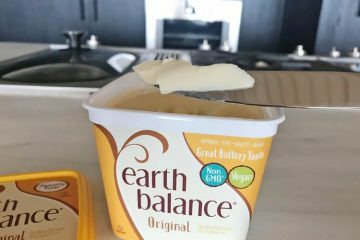 It appears those photos are due for updates, because that differs from what Kraft Heinz reports on their website as well as the labels we viewed ourselves. Bought it during the holidays a couple years back. In 2017 it was unavailable except at one obscure online retailer. In 2017 we couldn’t find it for sale anywhere. Their Facebook page did have some posts half a year ago, though it has been a ghost town since and we can no longer find their website in Google. If you’ve used Robbie’s Naturals products and sauces in the past, sorry to say but we are fairly confident they are now out of business. We would advise against buying old stock you may find on Ebay or Amazon, obviously something fresher would be better. We’ve been using it for Chex Mix recipes for a couple years now. It’s the most likely to please everyone with food allergies as well as the most common dietary preferences. Plus it’s organic. The only negative thing we have to say about it is that it’s somewhat high sodium, but no worse of an offender than the other brands on the list (and actually lower than most). The only low sodium Worcestershire sauce that was both vegan and GF was Robbie’s, but that’s no longer an option. As mentioned above, even in Los Angeles very few health food stores sell Edward & Sons The Wizard’s sauces. When we do see them for sale, their pricing is a ripoff. What we do is buy our specialty items like that online. Here’s the link for it on Amazon. This is wrong, the Worcestershire sauce from Whole Foods that I have does not have any items that are specifically gluten. The only questionable ingredients would be the white vinegar and the molasses, which one would want to check that they’re not derived from wheat. The soy sauce in the Whole Foods brand contains wheat. Lea and perrin’s is not safe. They changed the ingredient list to remove malt vinegar but the ingredient remains in the mix. You can find many results from searches of others with Celiacs, like me, who attest to the same thing. 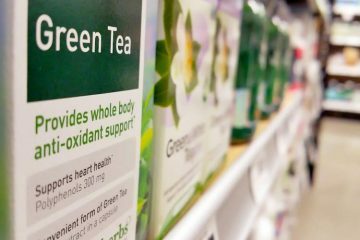 You can also find search results of the company admitting that they lied on their ingredient list. Be weary of Kraft and it’s subsidiaries as well, they have been busted with illegaly lying on ingredient lists. Great article and comparisons! Happy to announce we will soon offer Edward & Sons The Wizard’s GF/CF Vegan for sale at Snazzy Gourmet (online, of course). Whole Foods 365 Everyday Value Worchester Sauce Caution – please read and think twice before you buy this brand. You will be highly disappointed. For all of you that may be tempted to purchase WF 365 Everyday Value Organic Worcester – don’t if you are expecting anything resembling the Original Lea and Perrins flavor. If you are using it only to add to a seafood cocktail sauce, where there are so many other strong competing flavors, it may work for you. But that is about the end of its uses. The main problem here is that Worcestershire Sauce is prized for being an umami bomb – before there was even a word to describe it. And the umami comes from anchovies which are part of the Lea and Perrins blend and other top rated Worcestershire Sauces. Additionally WF 365 has also left out Tamarind that is also a player, and also included in other top rated sauces. 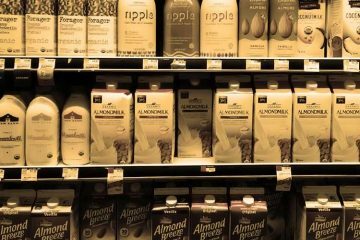 If you must go organic and not the original, spend a little more for Annie’s Organic. You will be much happier. It is truer to the Worcestershire taste and does contain tamarind. Whole Foods talks about their sauce as having” a whole host of unexpected spices”. It sure does but not in the right places. After these “unexpected spices” hit your tongue the next thing you are assaulted with is the sweetness and cane sugar is right up there on the ingredient list. In this sauce the second ingredient is molasses, sweet of course and the forth ingredient is sugar. In the Lean and Perrins sauce, sugar is the seventh ingredient. It’s no wonder this has a cola tone to it. Do not marinate an expensive cut of beef or douse it t with this stand in third rate Worcestershire. This is not just my experience but after reading other highly thought of reviews, it is also the opinion of those far more expert than me. Additionally the label won’t tell you if it is gluten free or organic. You’d need to try to figure that out from the ingredient list.